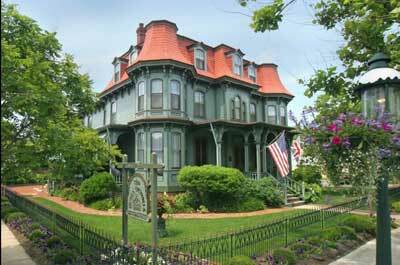 Our top picks for romantic Cape May bed and breakfast and Inns with Information on each of the B & B's. Cape May is an ideal destination for couples looking for that romantic getaway to celebrate a special occasion, or for Valentines day, or just looking to getaway for an intimate weekend for romantic dining, and great beaches, and a scenic Jersey Shore village. 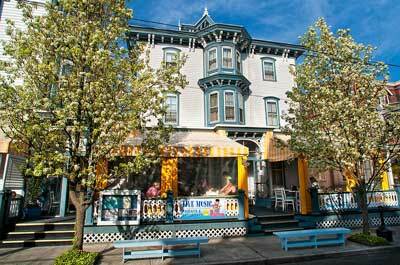 Cape May is a year round beach resort destination that comes alive in the summer. It's a charming town with tree-lined, gas lamp streets, quaint shops, and lots of fine dining restaurants and authentic Victorian homes and Bed and Breakfasts. 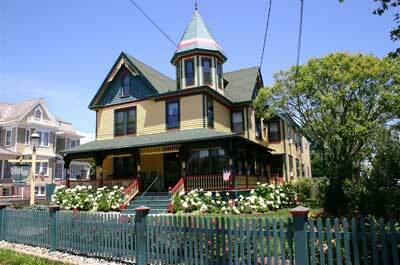 One of it's claims is that it possesses the largest collection of authentic Victorian homes in the nation. The inn offers a spacious screened in porch for sitting and watching the world to by as well as on-site parking. The Carroll Villa is a romantic Bed & Breakfast and offers 22 guest rooms. Guest rooms feature cable television. Other amenities include air conditioning and VCR's. It features conference rooms, a fireplace in the lobby, and a video library. Amenities include complimentary breakfast and complimentary parking. They also offer laundry facilities and dry cleaning services. This romantic B & B is in a great location. The beach, shopping, dining, attractions are all in easy walking distance. The front porch offers a nice spot for relaxing and enjoying the sounds of Cape May. The Virginia Hotel is an historic, romantic bed and breakfast located 2 blocks from shopping, restaurants and the beach. Continental breakfast can be served in your room. A Romantic B & B located close to the beach and shopping areas. They have complimentary beach chairs, towels and bicycles to get around town and the beach. The guest rooms at the Queen Victoria have air conditioning, TV's fireplaces, refrigerators, bathrooms with jetted tubs.